The Experts are almost unanimous is asserting that Britain will suffer once the Brexit deal has been struck with the European Union. Fear is the overriding emotion of those who want to reverse the 2016 referendum, in which people exercised their democratic right to redefine the future of their country. The psychology which frames the Brexit negotiations is calculated to deliver a bad outcome for both the UK and the EU. To transform the new relationship into one that delivers mutual benefits, Britain needs to scope out a plan that would guarantee prosperity for the UK, including an open economy that welcomes European engagement. 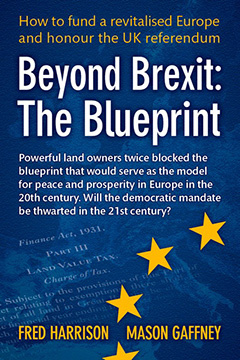 actions that can occur irrespective of Brexit, but which entail the leap of political imagination beyond the confines of the current socio-economic paradigm. First, consider some of the policies and strategies which follow emancipation from the rules and regulations enforced by Brussels. Farming: subsidies paid under the Common Agricultural Policy are a blight on rural communities. The cash transfers from taxpayers enrich the owners of agricultural land; they do not increase the wages of working farmers. Subsidies inflate the price of land above its true economic (rental) value. This makes it increasingly difficult for young people to enter the industry. Rural communities, consequently, are denuded of the vitality of new generations. The young are forced to migrate out of the hamlets and villages and hamlets. Beyond Brexit, the UK could ditch the subsidies in favour of a low-tax regime that would attract people back into the countryside, reviving the vitality of rural communities. Fisheries: ancient fishing communities down the east coast, from north-east Scotland to south-east England, suffered attrition as the EU common fisheries policy opened up UK waters to all-comers. Now, beyond Brexit, the barely surviving fishing industry can recover. Coastal towns can once again flourish, by providing jobs and homes for the new generations to come. VAT: when the UK joined the Common Market in the early 1970s, this most regressive of all forms of taxation had to be adopted. The EU employs VAT to fund its activities. Parliament can now plan to ditch VAT in favour of raising revenue from sources that stimulate production and productivity. That, in a single stroke, would elevate economic growth above the long-run average trend. Labour mobility: cynically, the EU employs the doctrine of “freedom of movement” as a political safety value. People are forced to migrate out of the peripheral regions because the tax regime prevents them from finding employment. Outcome: the dumping of those victims of bad governance in more prosperous locations like London, where they hope to make so a living. This, in turn, displaces the indigenous population. Beyond Brexit, the UK can regulate the inflow of European migrants to cater for Britain’s needs, not the policy failures of Brussels. Easing the stress on the housing stock and welfare services would enhance the quality of people’s lives. Super-state ambitions: the architects of the EU’s future realise that the union is fatally flawed. But instead of reforming the foundations, they are touting a more centralised union. This will render the EU even more unwieldly and resistant to change. The UK, instead, will be free to evolve its laws and regulations to ensure flexibility in its laws and institutions, to benefit from the exciting challenges that are defining the 21st century. Next, consider the policies and strategies which are possible within the current socio-economic paradigm, irrespective of whether the UK remained within the EU or not. Of these, the single most important one involves the financial sector. The EU is determined to obstruct the reach of the City of London across Europe. That will work to the UK’s benefit. At present, the British economy is seriously compromised by the top-heavy service sector. The financial industry operates as a burden on the sectors that create the most jobs and could add enormous value to the nation’s wealth. By diminishing the influence of bankers, and encouraging the emergence of regional financial institutions designed to support small- to medium-sized businesses, productivity would rise in leaps and bounds. The final group of policies and strategies are those that are not confined within the current socio-economic paradigm. Of these, the most important is the complete overhaul of the fiscal system. Economists know that the current way of funding the state, and the public’s social services, creates enormous deadweight losses. But government, HM Treasury and think-tank economists refuse to draw people’s attention to the scale of those losses. These have most recently been analysed in Debt Death and Deadweight. By creating a popular mandate behind the demand for a fiscal overhaul, the UK would end up growing at a pace that far eclipsed the rate that would result from being a member of the European Union. Cumulatively, these policies and strategies would transform Britain beyond recognition. Westminster would devolve more powers to the levels where they would be most effectively implemented. Central government’s functions would automatically adjust to ensure maximum personal freedom, while enhancing the social solidarity that unites the four nations of the British Isles. An ethics-based formula for sharing the net income – the rents produced by all four countries – would organically rebalance personal relationships while ensuring prosperity for those who chose to live in the regions farthest from the metropolitan centres. The UK’s approach to the EU, and to the rest of the world, would be driven by the fusion of a responsible kind of statecraft that was graciously laced with respect for the rights of others. We may reasonably assume that the spirit of a new kind of United Kingdom would become infectious, tending to enrich the global institutions which are now being branded by President Donald Trump as alien intrusions in domestic affairs. This is a project based on can-do realism. The Experts who are spreading fear in the United Kingdom refuse to weigh the benefits of these possibilities. Their minds are cocooned within echo chambers that tell them what they want to hear. For the sake of their children, the peoples of the British Isles need to listen to alternative voices. Once upon a time, the folk of these islands led the world. They can do it again.